A chemical reaction transforms the molecules that make up matter. To influence chemical reactions, chemists typically act on the molecules themselves, rather than the space in which the reaction takes places. However, researchers at the University of Strasbourg have shown that chemical reactions can indeed be influenced simply by conducting them between two appropriately spaced mirrors, kept only micrometers apart, a vessel physicist call an “optical cavity”. Inside these microscopic “optical cavities”, like everywhere else in the universe, electromagnetic fluctuations happen, even in the dark. These fluctuations can be thought of as waves confined between two walls. When the walls are spaced at a suitable distance, the waves are amplified, just as the movement of a swing is amplified when pushed at regular intervals corresponding to its swinging frequency. When a liquid is injected between the walls of the cavity, the electromagnetic fluctuations interact with the molecules inside, provided that the cavity resonates with one of the molecule’s vibrations. If the interaction is strong enough, the vibrations and optical resonance form hybrid states (half photonic, half vibrational). In that case, the molecules can be said to be under the influence of vibrational strong coupling (VSC). The teams of professors Thomas Ebbesen and Joseph Moran, specialized in nanoscience and chemical catalysis, respectively, began a collaboration in 2015 to try to understand if VSC could have an effect on chemical reactions. The following year, they published a first article showing that it is possible to slow down the deprotection of a trimethylsilyl protecting group by fluoride by a factor of five. These promising results led them to try to control the selectivity of chemical reactions by VSC. In other words, to study the possibility of promoting the formation of one product over another in a transformation that could give two different outcomes. For this purpose, they designed a substrate comprising two distinct silyl groups that can react with the fluoride ion to form two different products. 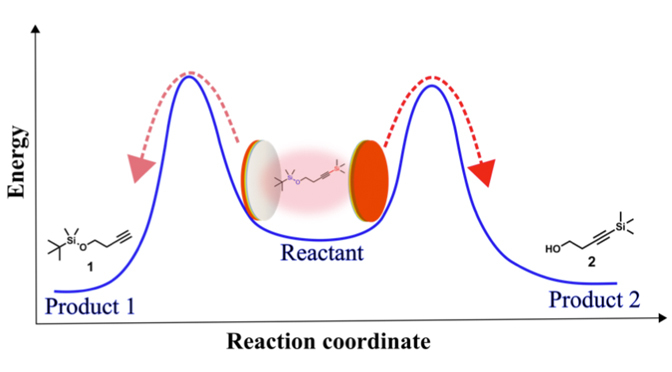 By tuning the optical cavity to different vibrations of the molecule, they could not only change the relative yield of two products, but also show which vibrations are involved in the reaction mechanism. This pioneering discovery is a proof of concept that opens the way to control chemical reactions by simple physical means: by adjusting the distance between two mirrors in the dark. Moreover, it is a tool to understand fundamental chemical reactivity. But the collaboration between the two teams does not stop there. They are currently studying other types of reactions to try to understand the rules that govern chemistry under the influence of VSC.